Note: Production data are estimates. Production of natural gas in the Marcellus region, located in Pennsylvania and West Virginia, is expected to exceed 13 billion cubic feet per day (Bcf/d) this month, based on estimates in the U.S. Energy Information Administration's latest Drilling Productivity Report (DPR), which will be released later today. The Marcellus region, which produced less than 2 Bcf/d as recently as 2010, is expected to provide 18% of total U.S. natural gas production this month. The total natural gas production estimate is marketed production, while the DPR estimates gross withdrawals, so coming up with a precise percentage is difficult. 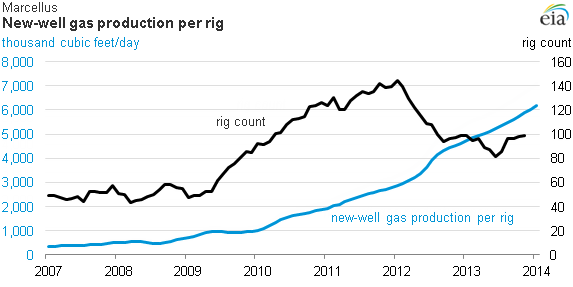 The rise of Marcellus production in both absolute terms and as a share of total U.S. production is a key development in a rapidly evolving U.S. natural gas market. Recent infrastructure upgrades in West Virginia and Pennsylvania have helped boost production volumes. Production growth in the region has driven the forward price of natural gas at the Columbia Gas Transmission Appalachia hub below Louisiana's Henry Hub price, the benchmark for natural gas throughout North America. Natural gas pipeline expansion projects are expected to add at least 3.5 Bcf/d of takeaway capacity to the New York/New Jersey and Mid-Atlantic markets by 2015. Natural gas production in the region has reduced the flow of natural gas from other regions into the Northeast.